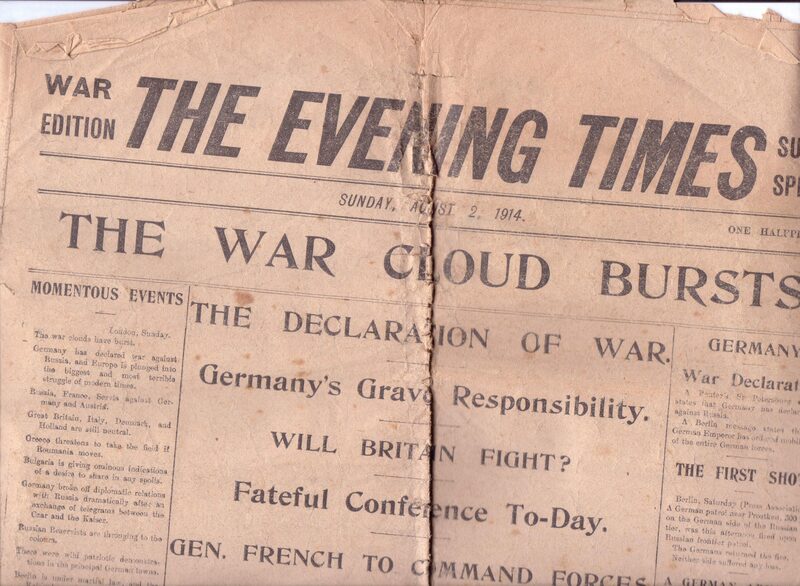 This section will cover documents and photographs relating to the First World War. In particular, it follows the fate of my grandfather, Douglas Jerman Thomson. Douglas was born in Leith in 1897, and grew up in Elm Place, Leith and then Balfour Street, Kirkcaldy. He began an engineering apprenticeship on 13 April 1913 at Messrs Douglas and Grant, Engineers, Dunnikier Foundry in Kirkcaldy. 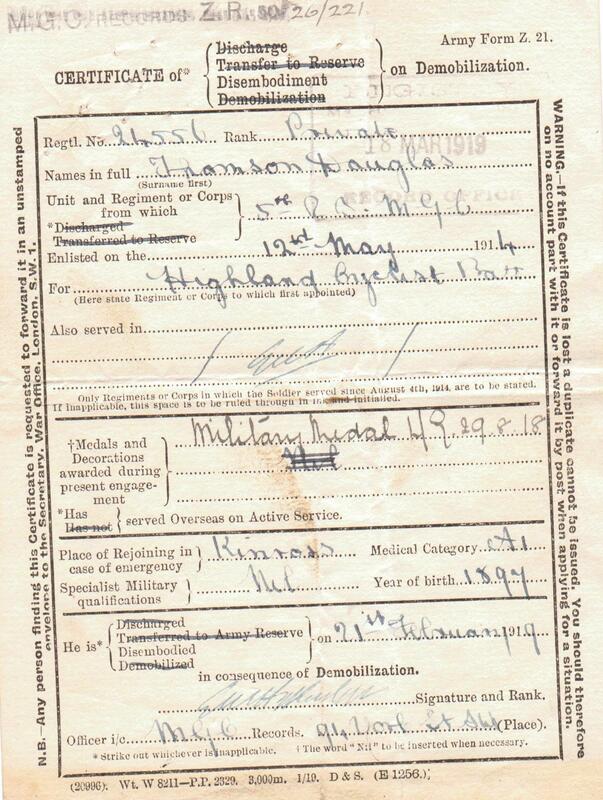 On12 May 1914, he joined the Highland Cyclist Battalion as a Territorial. He was 16 but gave his age as 18 in order to join the army, and qualify for free bicycle (or so he said). He was a Boy Scout and member of the Boys Brigade also, and put his membership of the Territorial Army pretty much on the same level, he told me in the 1970s when he lived with my parents and me. This shows the Glasgow Evening Times for Sunday 2 August 1914. The newspaper is a special edition, and was almost certainly bought by my great-grandfather, John Beck., a journeyman engineering fitter, who was resident in 1911 at 5 Elder Park Street, Govan, Glasgow. Click on the image to read more easily. The war machines of the Great Powers were already on the move, and the paper examines what is known to be happening in Europe in considerable detail. 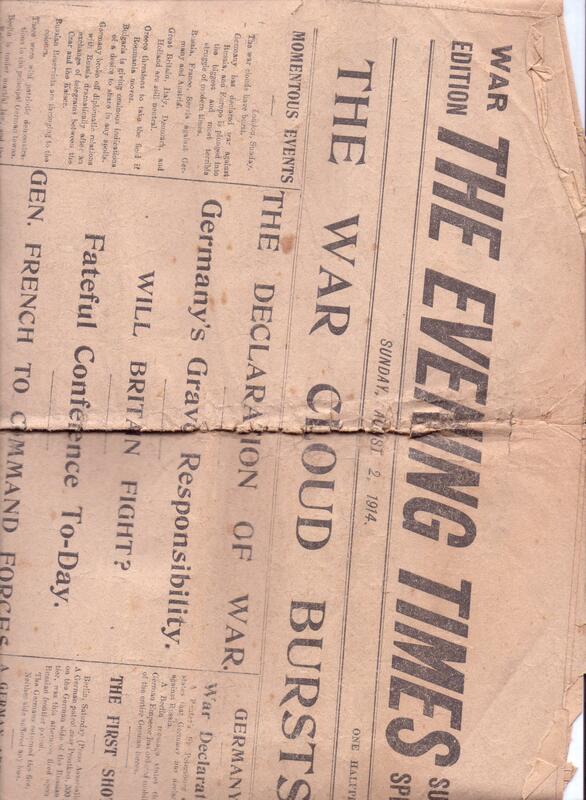 War was declared between Britainand Germany on Tuesday 4 August. The consequences of war breaking out were not long delayed for Douglas. 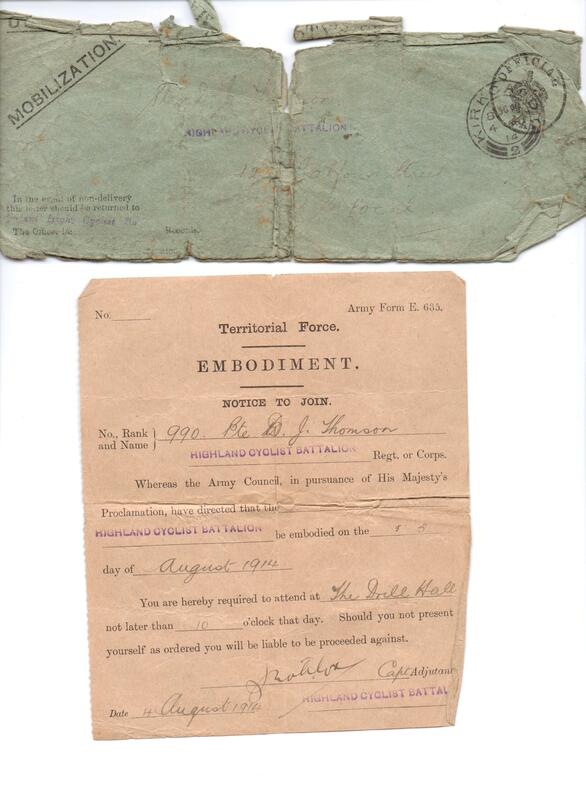 A notice of embodiment, with the original envelope dated 4 August 1914, was received at his home, 123 Balfour Street, Kirkcaldy. He was to report to the Drill Hall in Kirkcaldy not later than 10 o’clock on 5 August. Click on the image to see in more detail. From now on he was No 990 Pte D.J. Thomson of the Highland Cyclist Battalion. 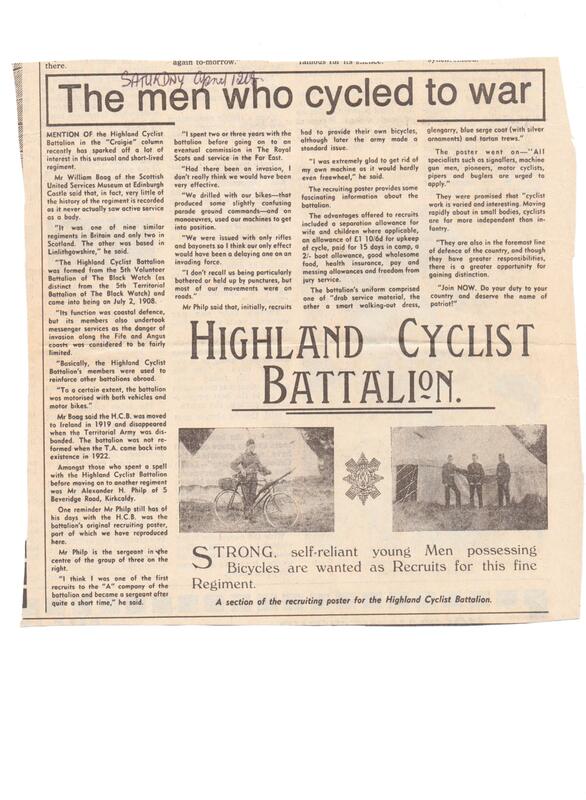 So what was the Highland Cyclist Battalion? The Highland Cyclists were formed in 1908 from a Volunteer Battalion of the Black Watch, and were one of nine cyclist battalions in Britain. The army, ever alive to new technology, contemplated the bicycle as a means to move large bodies of infantry quickly. 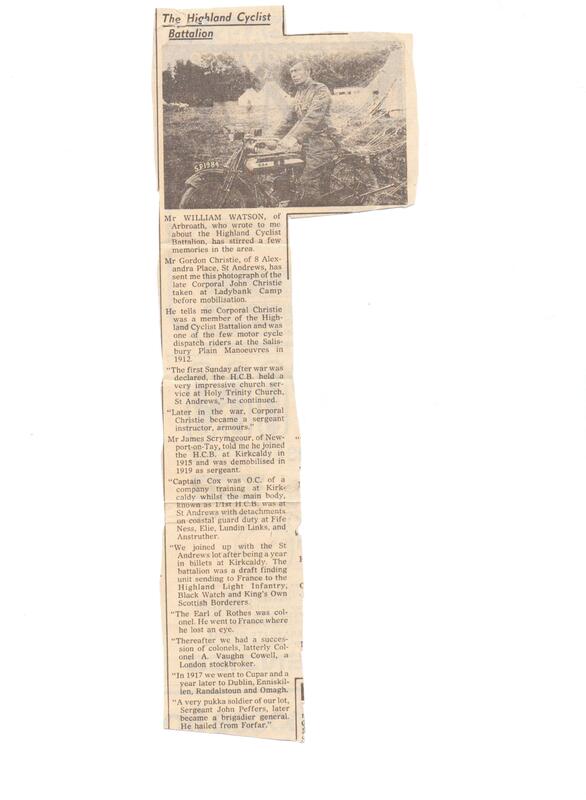 In 1979, there was correspondence in the Dundee Courier regarding the battalion, generated by its last surviving members. Douglas was 81 at this time, but still an avid newspaper reader. He cut out the following which explains what the battalion did, and gives some first hand accounts of its war record by veterans. He was content not to write to the newspaper. Click on the image to read (full screen) and click again if too small to read comfortably. As mentioned in the third article above, Douglas and the first battalion were deployed to St Andrews and thence he was attached to the company based at Lundin Links, on coastal guard duty, only a few miles from his home. Specifically he was garrisoned at ‘The Firs’, 7 Crescent Road, Lundin Links — see picture above of the house from circa 1890. It is the one on the left and on a corner. I owe this information to Dora Roden who is a local historian in Lundin Links and she located the camp cooking photograph (below) to the front garden of ‘The Firs’. The house still stands pretty well unaltered externally. The house belonged to the Bremner family, one of whom was the local postmistress, and was let out for the holidays each summer. The photograph below of him (on the right) and two companions in “drab service material” was taken by J Fairweather of St Andrews. The other photograph of him is in his “smart walking-out dress, glengarry, blue serge coat with silver ornaments, and Black Watch tartan trews”, and comes from the studio of Bramwell and Ferguson, Leven. Again, click on the image to see the image full screen and click again if you wish to study detail. Along with this uniform went the cap badge of the Highland Cyclists Battalion. This is a very rare badge indeed, so you can understand that I was surprised last year to spot not one but two copies from a militaria dealer in London. These were indeed just that — copies. 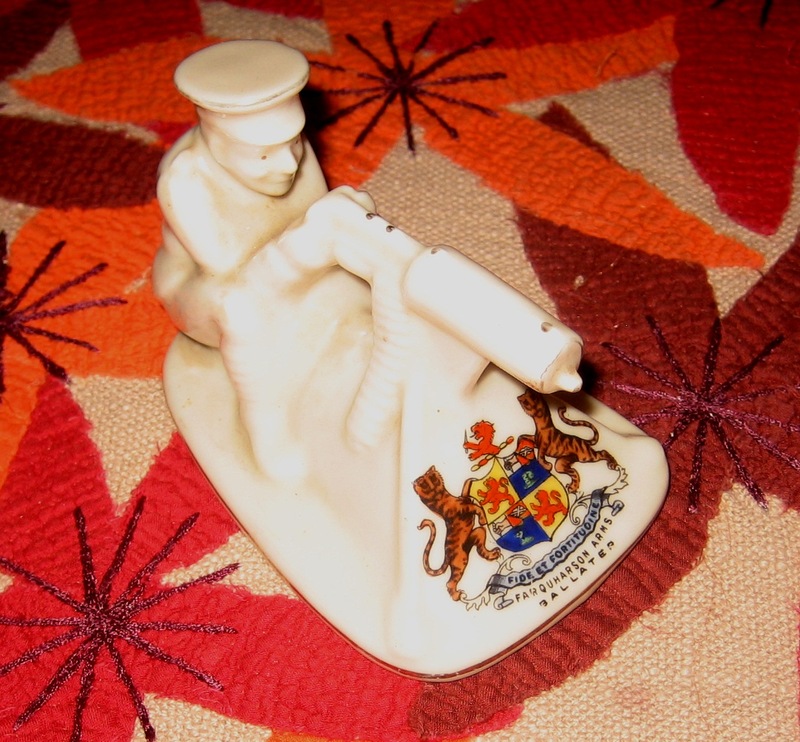 Apparently the MOD released the original moulds a few years ago, and vintage regimental cap badges have been churned out ever since. They are crude in comparison with the real ones, lacking detail and clarity. They also lack the very small metal bar inside my grandfather’s one which is stamped JR GAUNT LONDON. Here is an original which belonged to 990 Pte D J Thomson. On 10 October 1915, Douglas became 18 and his draft to another battalion in France would not be long delayed. In the event, he was posted a few months later to 26th Company of the newly formed Machine Gun Corps. This company was to be attached to 26th (Highland) Brigade of the 9th (Scottish) Division. The position of the Machine Gun Corps is summarised in the following two paragraphs from the Machine Gun Corps Old Comrades’ Association. “A year of warfare on the Western Front proved that to be fully effective, machine guns must be used in larger units and crewed by specially trained men. To fulfill this need, the formation of the Machine Gun Corps was authorized in October 1915 with infantry, cavalry, motor and in early 1916 a heavy branch. A depot and training centre was established at Belton Park in Grantham, Lincolnshire and a base depot at Camiers in France. I have learned from the Association that in fact a draft of 30 Highland Cyclists, including Douglas, went to the Machine Gun Corps at the same time. They were given the numbers 24530-24561 on transfer to the MGC (there was an aberrant Gordon Highlander in there as well!). 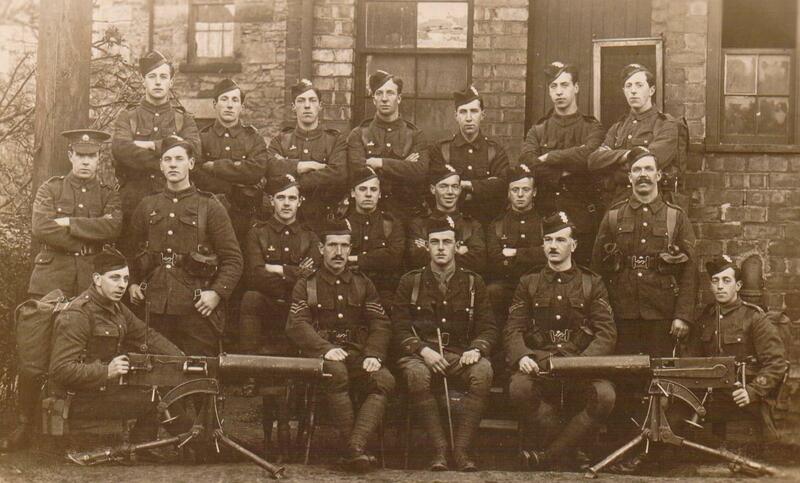 Most were from Kirkcaldy and district, although not all joined 26 Company MGC. The fate of 18 of these is known, and of these five died in the war. Please note that this is NOT an approved way of handling cats, and is slightly ironic as our family motto is “Touch not the Cat without the glove”. A story he told about the training period was that machine gunners were taught to disassemble and then reassemble the Vickers gun when blind-fold. This replicated doing it in the dark. Instructors regularly added extra springs and screws to test the unwary. This looks like a training session on how to construct machine gun nests. Remember to click on the image for more detail. It is probably around Spring 1916. Douglas is second from the left. 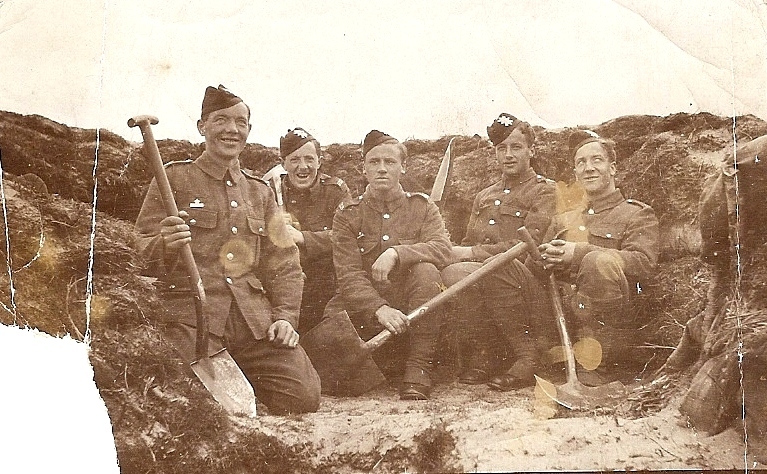 The photograph is contemporary with the more formal section photograph below, and all five “diggers” can be identified in the machine gun section photograph. This section of guns was closely identified with 5 Camerons, 26 Highland Brigade, 9 Scottish Division. Douglas said that whilst almost all of his actual fighting on the Western Front was in support of this kilt-wearing infantry battalion, the machine gunners were thankful that they were not wearing kilts. These quickly became sodden and mud spattered, even with the cover-alls used. In fact, in the front line, he often saw the Camerons wearing long-john underwear to stop the effect of sodden kilts chapping and cutting the backs of their knees. This shows a section of Vickers Machine Guns, belonging to 26 (Highland) Company, Machine Gun Corps. Douglas is in the back row on the extreme right. 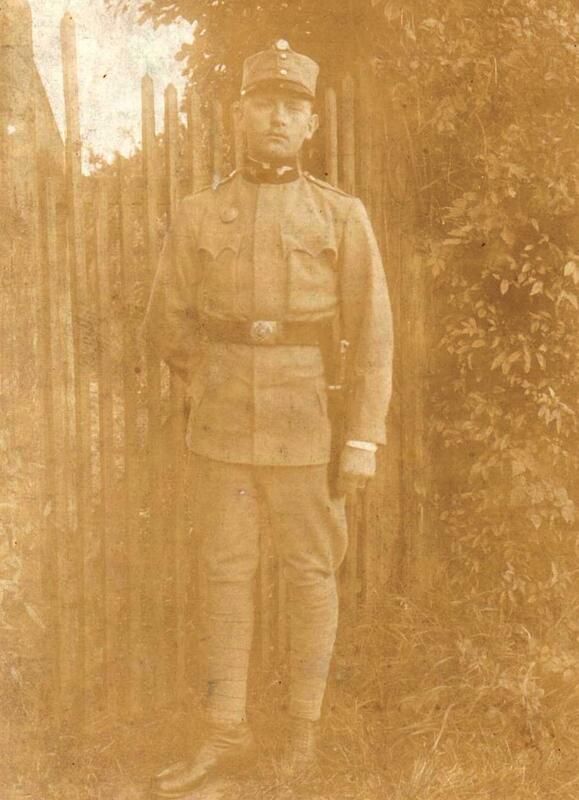 It is early 1916 and he is 18 years old. He said that his section were used in support of 5 Queen’s Own Cameron Highlanders. The 9th (Scottish) Division consisted of 26 (Highland) Brigade, made up of 8 Black Watch, 7 Seaforth Highlanders, 9 Seaforth Highlanders and 5 Queen’s Own Cameron Highlanders. The 27 (Lowland) Brigade was made up of 11 Royal Scots, 12 Royal Scots, 6 King’s Own Scottish Borderers and 9 Cameronians (Scottish Rifles). The 28 Brigade was the South African Infantry Brigade. It consisted of 1, 2, 3, and 4 South African Infantry. The 4th Battalion was the South African Scottish. Each brigade had a company of the Machine Gun Corps in support, numbered after the brigade. By 24 October the Division were withdrawn with 3, 255 casualties including 488 dead and 562 missing. Douglas was one of the 2,205 wounded. The official history says “Men with rifles and haversacks could scarcely struggle on, but their lot was easy compared with that of Vickers and Lewis Gun teams whose guns had to be carried up and also ammunition for them.” In lifting and dragging an ammunition box across the mud, he sustained a hernia. He was sent back, operated on and then had to lobby to return to his unit rather than be drafted into another. This he succeeded in and was back with the 26th Machine Gun Company by Christmas 1916. The Division moved to the Arras sector in December 1916, and on 9 April (Easter Sunday) 1917 were part of a major offensive. The 9th and 15th (Scottish) Divisions, the 51st (Highland) Division, and the 34th Division (with a full brigade of Tyneside Scottish) staged a successful attack along the River Scarpe. To the north, the Canadians captured Vimy Ridge on the same day. The official history noted this as “a very great triumph for British arms”. However, the Germans were able to reform their line futher back. At least one member of the 9th greeted the dawn attack in driving sleet with some degree of anxiety. The subaltern had crawled across the mud to the machine gun team with a canteen of watered down rum. Raising the canteen to his lip, Douglas found he was so stressed that he was unable to stop drinking it, and indeed emptied the whole team’s ration. He was sent back to get more. 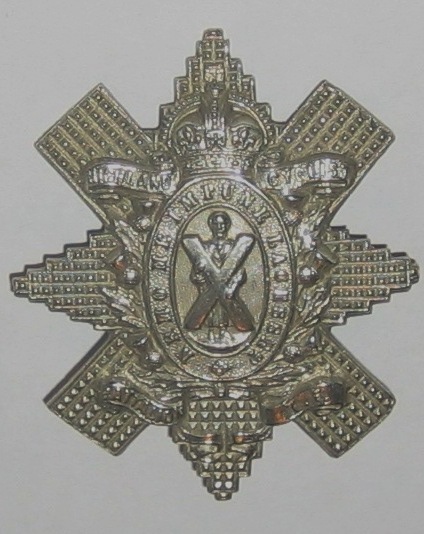 In later life, Douglas had three badges relevant to his service with the Machine Gun Corps, being a pair of crossed machine guns, an enamel lapel badge, and a Royal Artillery badge (the Machine Gun Corps being linked to the Royal Artillery). How or where these were issued I do not know, but they still survive. Click on image for detail. After the initial success there were several more weeks of heavy fighting but no break-through was forthcoming. By 5 June, the Divisional casualty list had risen to nearly 5,500, but Douglas was not among them. Indeed it was here that he met his first German, when escorting a file of prisoners to the rear. One of the older prisoners spoke English, and on the march to the rear, he discovered that Douglas was an engineering apprentice. He was an engineer too. “Imagine what we could build,” he said, “if only we stopped killing each other.” This was a conversation which stuck with Douglas for over 60 years. It was also near Arras that Douglas Thomson and his pals were resting on a grassy bank after being pulled back out of the line. Suddenly his boots were kicked on the soles, and a voice said “Trust the Machine Gun Corps to be asleep”. 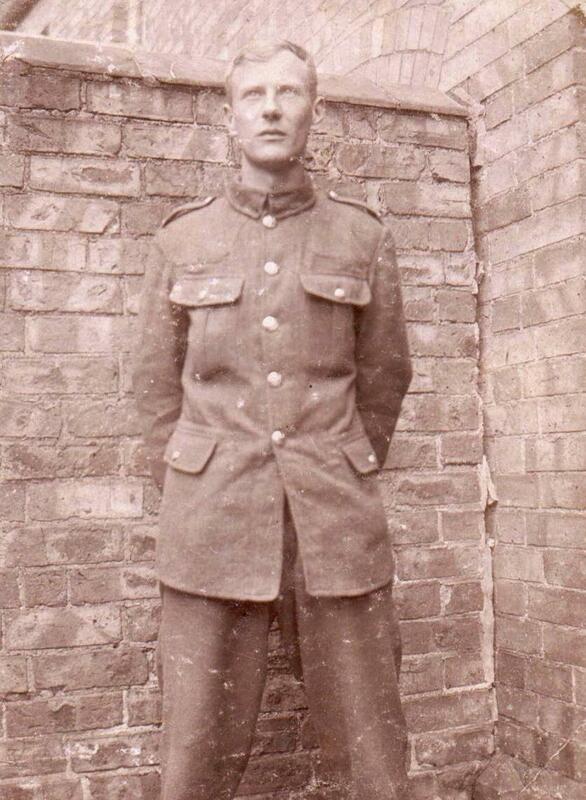 It was his elder brother, James (Jimmy) who was a time-served engineer, and now was with the Royal Engineers laying a telephone wire down that very lane. 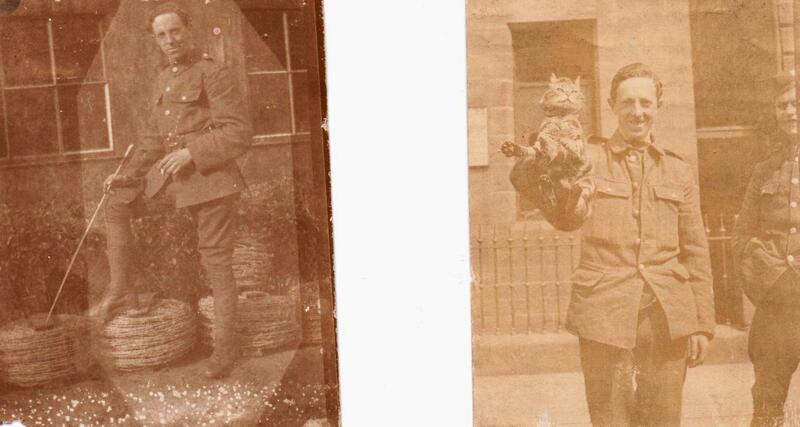 The oldest brother Edward (Ted) was with the Glasgow Yeomanry. All survived the war. Between June and 12 September, the 9th (Scottish) Division were in the Somme, largely involved with training, near Bapaume. on 12 September the dividion was moved north by rail to Ypres. Aged 19, Douglas found time to meet a French girl in the shattered town of Bapaume. I do not know her name, but I was told that her fiance had been killed early in the war. He got a pass for 7 hours to see her on 5 September 1917 in Bapaume. 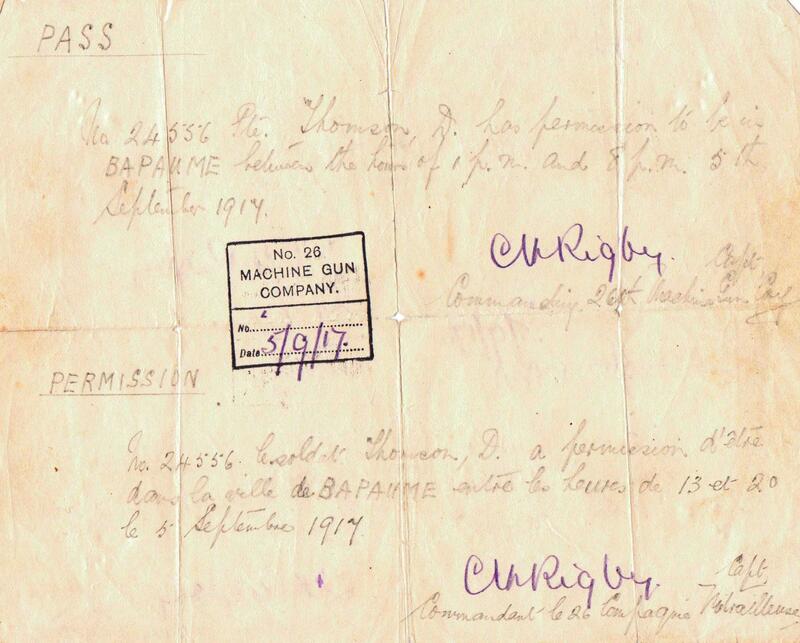 Amazingly this pass, written in pencil in both English and French, by the commanding officer of 26 Machine Gun Company, Captain C.V. Rigby, survives. it was necessary to have such warrants as otherwise the military police might arrest a soldier for desertion. A photograph of the French girl survives: she had very little possessions surviving as Bapaume had been at the centre of heavy fighting. Apparently she cut a photograph in half (presumably removing the fiance! ), and he kept it. The 9th Division were transferred to the Ypres sector, where an offensive had been underway since July. By the time that Douglas Thomson arrived on the Passchendaele battlefield, the British army was launching attack after attack on a series of low ridges which were surrounded by glutinous shallow valleys of mud. The 9th attacked Frezenberg on September 20th, and captured a ridge which was studded with concrete pill-boxes. Two Victoria Crosses were won. On 12 October, the Division attacked towards Passchendaele village itself. 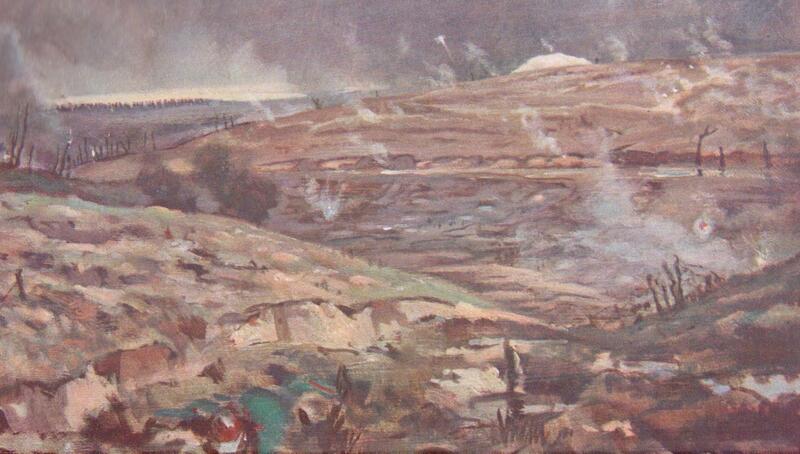 The attack never really got going with men unable to advance in thick mud, and under constant fire. For two weeks the brigades rotated in hopeless conditions, and then were withdrawn with a total of nearly 5,000 casualties, including 850 dead. They had advanced barely 100 yards towards Passchendaele. My grandfather said to me that it was a common impression that the battlefields were just mud and water. In fact the ground was studded with debris including remains of human bodies, bits of kit, unexploded shells and litter blowing around. One of the things which he hated most were the many photographs to be found on the ground, in pools or just blowing back and forth. He made a practice of picking up and drying out such photograps and he returned a number of these after the war to families in Britain and Germany,where there were addresses to do so. He hoped that some-one might do the same for him, if it came to it. 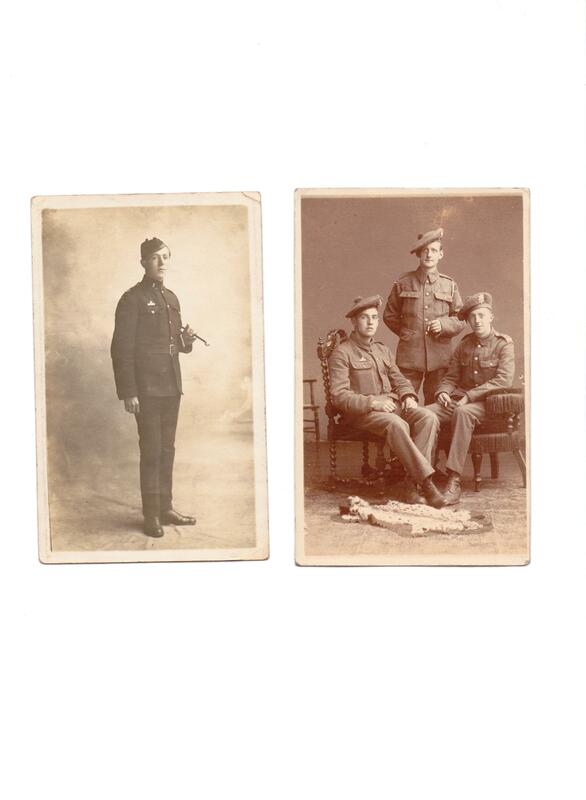 A number of photographs had no such addresses, and these he put into his own family photograph album after the war. They number a dozen in number. Of these, two British and two German soldiers (one of these may be Austrian?) are shown. We know nothing about them, but they have remained respected and safe in the album for over ninety years. It would be nice to return them to the ir families, but this seems unlikely after all this time. The soldiers are deliberately mixed together here as they are in the album. As always, click on the image for a more detailed picture. 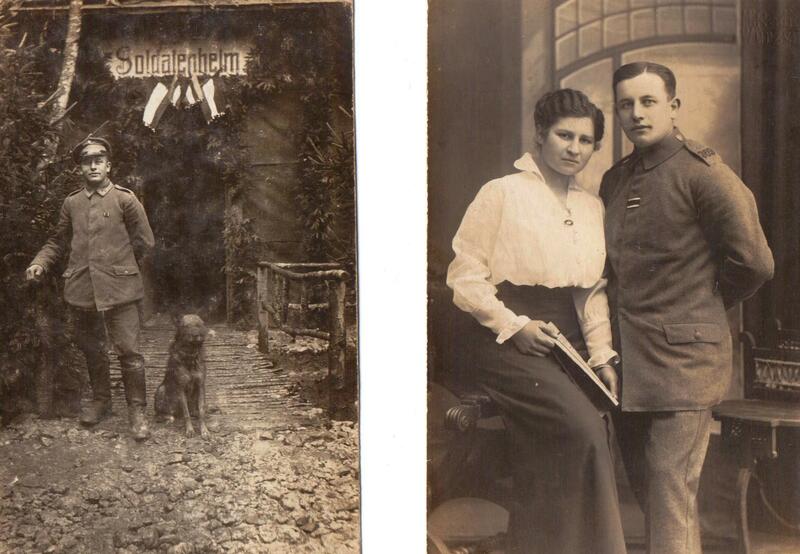 German soldier of 369 Regiment with wife. On 21 March 1918, the division with the machine-gunners was at Gozeaucourt, which is to the east of Bapaume on the Somme. It was in the eye of a storm as the last great German offensive of the war propelled the 9th Division along with many other more than 20 miles backwards to Albert. It was a fighting retreat, and the Division just about held together. The official history notes that Haig said “Great gallantry has been shown by the troops engaged in the fighting – the 19th and 9th Divisions have distinguished themselves by the valour of their defence.” Casualties were many and by 26 March, the Division were down to 1,340 effective infantry, and 20 machine guns. One of those machine guns was now under the command of Lance Corporal Douglas Thomson, with half a dozen surviving comrades. From analyzing the Divisional history, it would seem that it was in this week of constant retreat, fighting stands, rapid deployment and more fighting that he won his Military Medal. I have not been able to find a citation for this. The way that he explained it to me was that the British were making a fighting retreat and everything was very fluid with no-one sure where they were going. In the midst of this, they had been firing from a field boundary, with the dog cart, pulled by a mule, in the corner of the field behind them. Suddenly they saw Germans advancing towards then at right angles in the next fields. They could escape away but this would mean leaving the cart, and this was the only way of carrying the Vickers gun and all the ammunition boxes and belts. Effectively they would have to abandon the gun. As the Sergeant who normally fired the gun was a casualty, Douglas was acting as gun commander. He thought it was down to him to run and get the cart, and bring it back to the team so that they could withdraw the Vickers. When he got to the cart, the Germans were within a couple of hundred yards, so he applied his army boot to the rear of the mule (they were notoriously non-starters on occasions) and careered across the field to his pals. Then it was in with the gun, boxes and belts and off at high speed. This was witnessed by an officer, and in due course (actually April 1919) a Military Medal arrived. 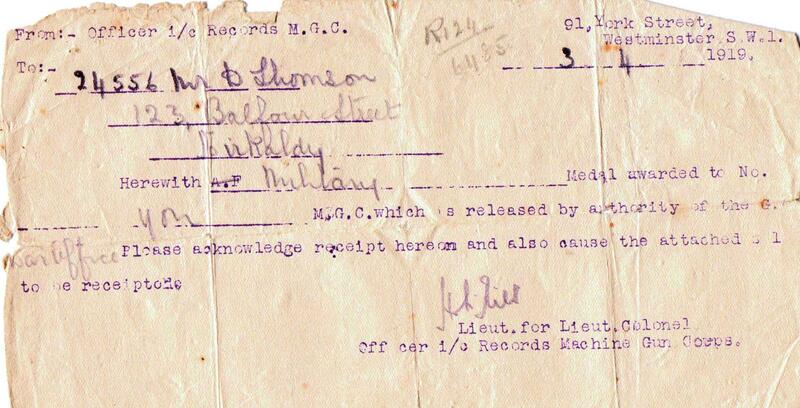 The award of his MM is noted in the War Diary of 9 Battalion MGC on 5 May 1918. This gave Douglas an unusual medal group, because he not only won the Military Medal (MM) but had been a Territirial before the war. Most territorials crossed to France in 1914 or 1915, and thus held the 1914 Star or the 1915 Star. Douglas did not cross to France until 1916, and thus was awarded the general medal for Territorials, which was normally held by aged Territorial who did not in fact go to France, but stayed back to run the very necessary depot and training battalions. As such they were unlikely to have won a Military Medal for “bravery in the field”. Another anecdote of the March retreat was that they were riding on the dog cart down a sunken lane heading back to Albert when they became aware that a patrol of Germans was marching parallel to them, and in the same direction, along the crest of the lane. They merely whipped up the mule, and exited as fast as possible. Not a shot was exchanged. For my grandfather, there was one incident, one tragedy, which stayed with him for the rest of his life. This was the death of Second Lieutenant John Turnly of Drumnasole in the Antrim Glens. In the desperate fighting south of Ypres in April 1918, the battered remnants of 26 Highland Brigade of 9 Scottish Division fought with great courage to prevent the last great German assault of the War from breaking through. April 16 saw 5 Camerons strung out along a section of road between Wytschaete and Ypres. Just above the road, which was the Dammstrasse, south of St Eloi, two Vickers guns of 26 Company Machine Gun Corps supported them from dug-in machine gun nests. Turnly scrambled up the bank to better direct fire on the advancing Germans. They had occupied ‘Pheasant Wood’, to the south-east of the Dammstrasse. As he got to the sky-line, the gun commander of one of the Vickers guns shouted to him to keep down. It was too late, the young (19) and brave former student of Trinity, Dublin was hit in the head by a German bullet. He was dead as he fell. 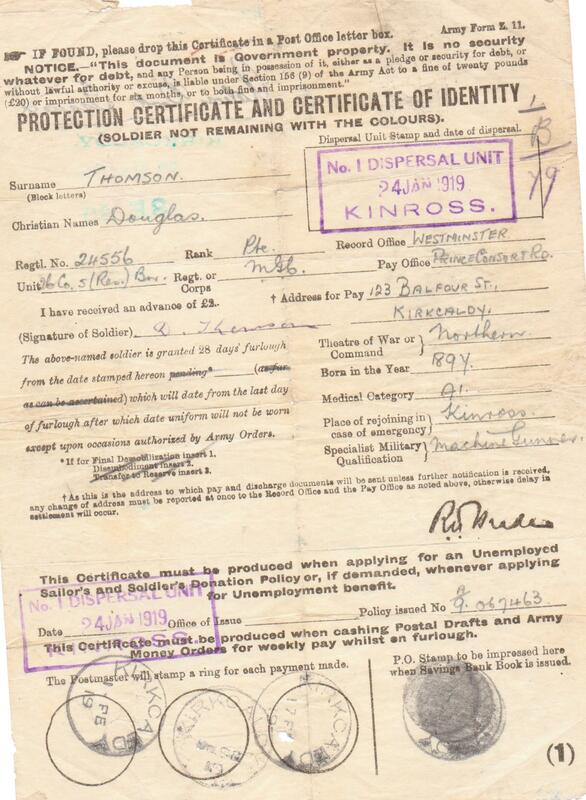 The man who shouted was Acting Sergeant (unpaid) Douglas Thomson MM, my grandfather. They buried him in the bank for later retrieval. Unfortunately the grave was lost in subsequent fighting. Today John Turnly is commemorated on the wall at Tyne Cot Cemetery. I identified the officer as John Turnly because he was the only Irish officer in a small Scottish unit, the dates matched, and so did the account given to Turnly’s father by the C.O when he wrote to him in Ireland in respect of his son’s death. The file is in the National Archives at Kew. The C.O noted that he could not give further details as the men who were with him were no longer with 26 MGC Company. That is true. 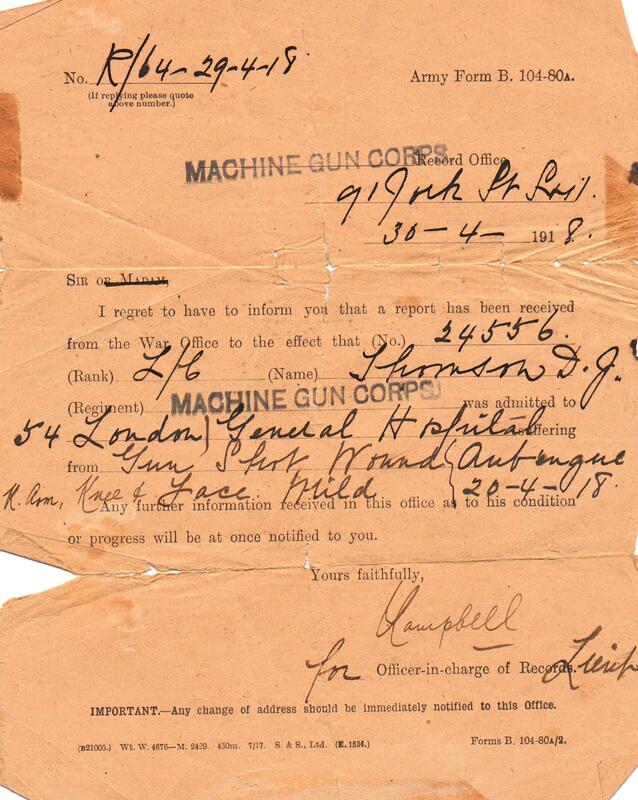 On 20 April, Douglas Thomson’s machine gun was taken out by an almost direct hit by a shell. The men were either killed or wounded. Douglas survived with shell fragments down his right arm, and loss of hearing in his right ear. A degree of shell shock faded over the years. However his memory of John Turnly never left him. Rest in peace, John Francis Turnly. Both the French and the British held after the intial withdrawals, and by the end of April the Germans had shot their bolt. However, the Division was subject to increasingly desperate attacks up until 26th April, and was subject to “relentless artillery fire” according to the Divisional history. One of those shells, on 20 April, was a nearly direct hit on the machine gun commanded by Douglas Thomson. 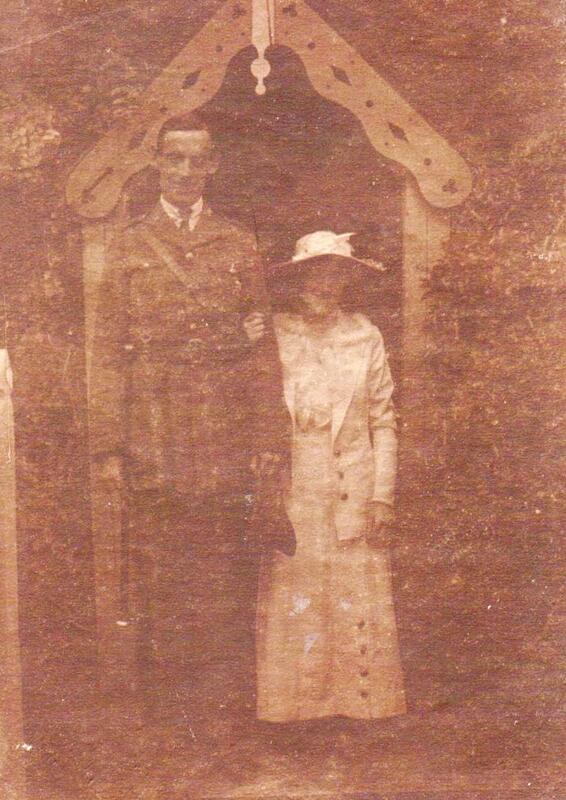 The letter was addressed to Mr D Thomson, 123 Balfour Street, Kirkcaldy but he had died in 1916. It must have been opened by Douglas’ mother Sarah who kept it. The mild gun shot wounds mentioned were in fact shrapnel from a shell. His wounds kept him in hospital and convalescence until Christmas 1918, after the end of the war. His account was that he was watching a field of fire, waiting for yet another German advance, when suddenly he was upside down with the gun resting on him, along with a lot of mud, bits of ammunition box, and bits of uniform.There was quite a lot of blood on his face. He couldn’t hear anything at first, and then was aware that some0ne was shouting that the team was wiped out. He tried to shout back, and eventually he was dug out along with one comrade. Every other member of the team was dead, and some bodies were badly mutilated. He had shell fragments all down his right side and arm, along with the right side of his head, and his ear drum was perforated. He was taken via the chain of dressing stations back to 54th London General Hospital at Wimereux, which is 3m from Boulogne in the Pas-de-Calais. From there he was evacuated on a ship and then a train to London, but not before his bag was rifled and anything of value stolen on the cross-channel leg. He was in several hospitals and then Alnwick Military Convalescent Hospital. This was for men from units in the Northern and Scottish Commands, men whose homes were in Scotland or who belonged to Scottish regiments from any command. It was a hutted convalescence base in the meadows, across the river from Alnwick Castle in Northumberland. For more than ten years he often awoke to bits of shrapnel on his mattress, and in later life was quite deaf on his right side. His arm remained scalloped and marked until he died. At first he also suffered from nightmares of being buried alive, as well as intemperate rages. These were probably indications of shell shock, and gradually lessened over time. After surviving the threat of being sent to Murmansk in a draft of machine gunners being sent to fight with the White Russians, he was sent to a dispersal unit at Kinross on 24 Janauary 1919. On 21st February 1919, he was formally demobilized. His time as as a soldier had lasted four and a half years and he could now return to his apprenticeship. Douglas & Grant, Kirkcaldy, kept his engineering apprenticeship open and he duly qualified in 1921 as an engineer. They noted on his indenture papers that he had been absent with leave for four and a half years, having been in the army. In the summer of 1919, he and half a dozen survivors from the old Highland Cyclist Battalion went on a cycling holiday of the Highlands. He was certainly in Ballater, having cycled over the Devil’s Elbow from Glen Shee into Deeside, where he purchased a porcelain machine gunner from the Farquharson Arms in Ballater. A good momento for a Highland Machine Gunner. 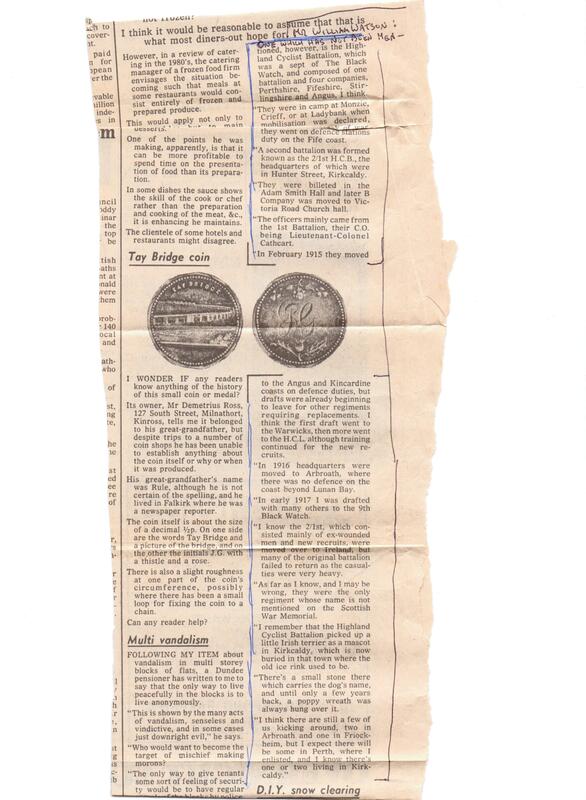 This article was posted in Family History Archive. Bookmark the permalink. Follow comments with the RSS feed for this post. Both comments and trackbacks are closed.